Do I need a martingale or a house collar? All my 1.5” and 1” collars are available as a martingale or a house collar. 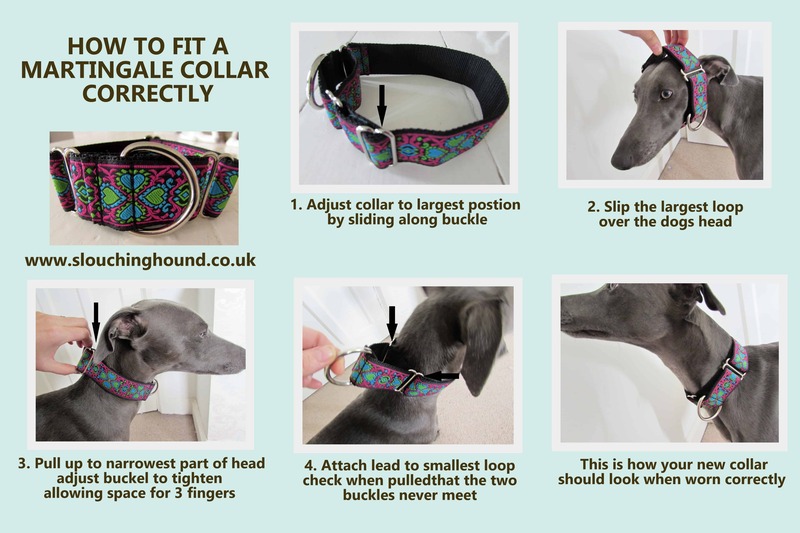 Both collars have different uses so please make sure you have ordered the correct style. The house collar is designed to be worn in the house and used to attach a tag for i.d purposes. It is now law that all dogs must wear id at all times even when in the house. All my house collars are satin lined or fabric wrapped for extra comfort around the house. The house collar is not recommended for attaching a lead and walking you will need a martingale for this. A martingale collar is a special type of collar that provides more control over the dog without the choking effect of a slip collar. The martingale dog collar was designed for sighthounds because their necks are often larger than their heads and they can slip out of buckle collars. These collars are popular among owners of other breeds too with many trainers now recommending them instead of choke chains or buckle collars. A martingale collar is made with two loops. The larger loop is slipped onto the dog’s neck and a lead is then clipped to the smaller loop. When the dog tries to pull, the tension on the lead pulls the small loop taut, which makes the large loop smaller and tighter on the neck, thus preventing escape Properly fitted, the collar will be comfortably loose whenever the dog is not pulling against the leash. It is recommended that you remove your martingale collar when unsupervised or in the house. 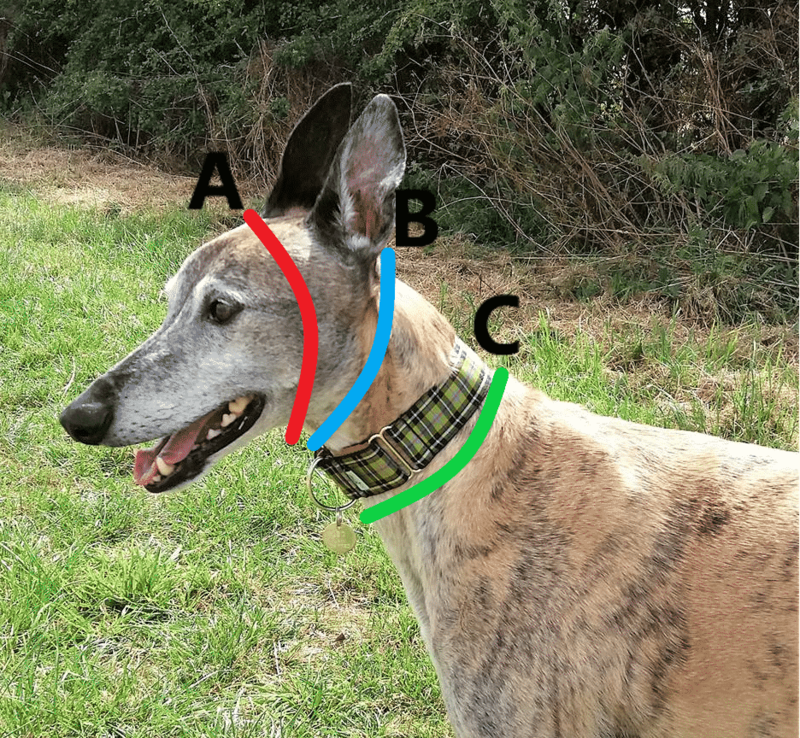 To measure your dog for a Martingale Collar, use a soft tape measure or a piece of string and take the measurements at point A, B, and C as in the picture. Choose the size that fits within this range to ensure that your collar fits perfectly. For Sighthounds, the measurement at points A and B may be the same or very similar, this is because their heads are often the same size or smaller than their necks. For non-sighthounds, these measurements will be different and you will need to choose a collar size that is large enough to slip over the head (point A) but not too large to fit correctly at point B. Always choose the smallest size that will still fit your dog.